Day 19! 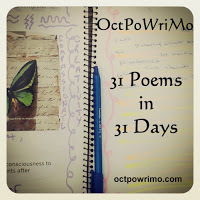 I am finding it hard to believe that I have managed to 'stay alive' through the first 18 days of #OctPoWriMo. It is a real challenge to write a poem everyday, never mind to write something that others might enjoy. I am very overwhelmed with the positive feedback I have received, and for that I thank you all. Today's prompt is rain, and we were given a list of words we should try incorporate into our work. Those words are melancholy, drizzle, damp, rainbow, cloudy, grass and somber. I actually wrote 3 poems for this, and wasn't really satisfied until the 12th edit of the 3rd poem. And so, I share with you today's poem, and sincerely hope that you all get to experience a Kiss in the Rain. I pull you into it’s depths. I like this. A very sweet and warm moment during a cold and rainy atmosphere. Three poems, today, huh? I applaud that. Writing a poem in one day (and a good one at that) is a challenge for me. Great job! I've never seen a walk in the rain as this romantic. Makes me smile. I'm so glad you smiled! Thanks for visiting! I love this Rod. Especially "damp shoes provide/no warmth to our feet,/but somehow that just/doesn’t matter." And you have been doing awesome in the challenge. I'm going to miss the challenge, but I now have new places to visit and read in the mornings. Thanks so much for your feedback, Jessica! This challenge is getting harder, but my promise to myself was to make it through! It definitely is lighting a fire in me, renewing my passion for poetry. Aw, thanks a whole bunch, Cindy!! What a beautiful, romantic poem! And you do the rain prompt justice here too. So much heart in your writing! Thank you so much, Christine! I really appreciate your words, and your visit to my humble site! After reading this, I have a soft smile on my face. It reads like the sweetest romance. Sweetness and fire, fed by the rain and the shadows. Lovely. Captures the depth and passion perfectly.